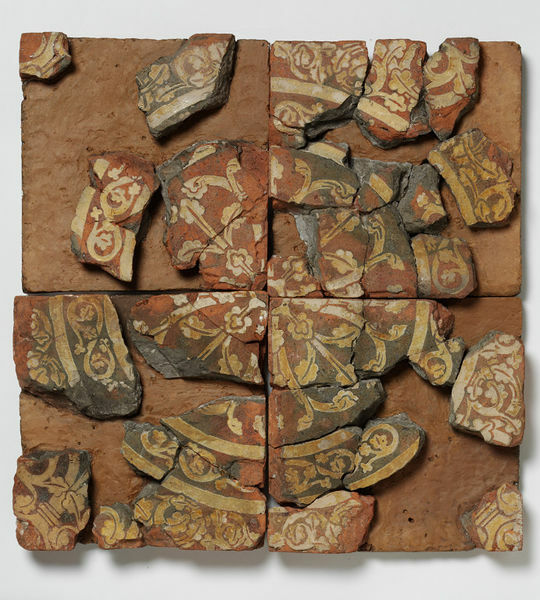 These fragments of a tile were once part of a highly decorated floor at Chertsey Abbey, Surrey. Pavements of decorated ceramic tiles were a medieval innovation. They were used to add richness and splendour to great churches initially but they were subsequently used in secular contexts, including castles and royal residences. The pattern on this example has been created by inlaying white decoration into the surface of the tile. In this instance the complete pattern was formed across four-square tiles, all of which are now fragmentary. The work of the tilers at Chertsey was of the highest quality. Chertsey Abbey was dissolved during the reign of Henry VIII in 1537. Excavations in the nineteenth-century uncovered traces of its former glory and the skill of the craftspeople who worked there. Eight pieces of a tile have been set into a modern material that reflects the dimension of the original when whole. This tile is one of four at the V&A each once comprising a quarter of a symmetrical design. The others three tiles are 447:1-1905, 447:2-1905, 447:3-1905. All of the four tiles are now fragmentary. The pattern on the tile was created by inlaying white clay into the surface of the main body of the tile. The pattern, when complete, included two concentric quarter-circular bands of white clay. The inner band defined a quarter of a roundel. The outer and inner bands enclosed a border of scrolling foliage surrounding the quarter-roundel. The corner bordering the outer-band was also filled with a pattern of scrolling foliage. When complete the four tiles, each carrying an identical design, would have formed a square panel, with the white-inlay delineating a symmetrical circular pattern. The complete design for this tile can be seen in Eames 1980, Vol 2 (Design 1031). Transferred from H.M. Office of Works. Production of tiles for Chertsey Abbey, Surrey seems to have begun round 1250 and continued for most of the thirteenth century. Earlier tiles included individual pictorial roundels. Here the roundel (and its border pattern) is not a separate piece of ceramic, rather it has been defined with white inlaid decoration. The complete design would have been formed by four individual square-tiles each of which comprised a quarter of the entire design. 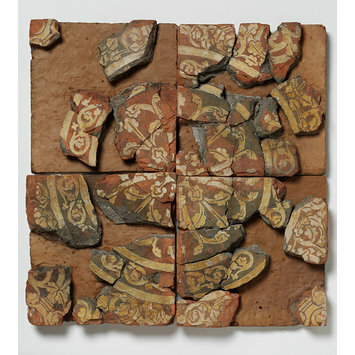 The tiles from Chertsey Abbey form part of a group of related tiles which include those still in-situ in the Chapter House of Westminster Abbey, as well as some found at Winchester, Hailes Abbey in Gloucestershire, Halesowen in the West Midlands and other sites. There are several tiles with an identical design to this one in the collections of the British Museum. Most of these are associated with Chertsey Abbey. Eames also gives a complete design for the tile which is helpful in giving a sense of what the V&A tiles (447:1 to 4-1905) originally looked like (Design 1031, Eames 1980 Vol. 2). Historical significance: The tiles from Chertsey have a particularly intricate inlaid design. Unlike most medieval inlaid tiles they were probably moulded, rather than stamped with the design, before the white clay was inlaid. This was a time-consuming process. Eames notes that the work of the Chertsey tilers was 'decoratively and technically better than that of any other medieval tilers known in France and England. She speculates that the designs were drawn by one of the king's painters, based on manuscript illustrations, and that the designs were then carved into wooden blocks by a master carver. The wet clay was probably pressed into these moulds, rather than being stamped with a design when leather-hard. The Benedictine Abbey of St Peter was founded in the seventh century. There is a reference in Bede's Ecclesiastical History of the English People. On the 6th July 1537 Chertsey Abbey was surrendered by the Abbot, John Cordrey, and the history of the Abbey as a living institution came to an end. The destruction of the Abbey was extensive. Manwaring Shurlock (1885) gives an account of the recovery of the tiles from the site of the Abbey up to the point at which he was writing. He records that tiles from Chertsey were exhibited by Mr Wightwick in 1787 (1885, p7) reflecting antiquarian interest in the Middle Ages. He notes that in 1852 Mr Samuel Grumbridge uncovered many tiles whilst searching for buildling stone on the Abbey site. In 1861 further excavations took place which uncovered more fragments of tiles. Shurlock speculates that tiles in complete condition were probably removed at an early date, whilst those that were damaged during the depredation of the Abbey buildings were left in-situ. From Chertsey Abbey, Surrey; about 1260-90. Eames dates tiles from Chertsey Abbey with the same design to circa 1290-1300.